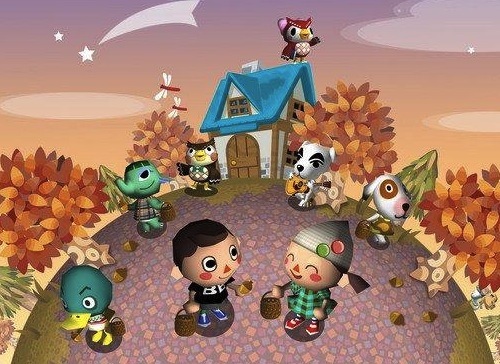 Do you ever wish real life were a bit more like Animal Crossing (Dōbutsu no Mori, if you're Japanese)? You know, instead than toiling away in a cubicle--if you're lucky--for 40-plus hours a week you could spend that time catching fish, designing clothes, digging up fossils and picking fruit? Well, I do. Sure, living next to a bunch of anthropomorphic cats, dogs, horses and other animals is likely to be an odd (read: kind of creepy) experience, but I think I'd give it the old college try--as long as the hubs agreed to join me--if I were offered the opportunity. Thankfully, I don't have to waste too much of my time daydreaming about any part of the above-mentioned scenario coming true. That's because I just discovered, via neogaf.com, the real-time Animal Crossing music player that can be found at http://tane.us/ac/ and that makes pretty much any mundane chore or job a bit more enjoyable. Note: You can switch between listening to the GameCube version's soundtrack and the DS/Wii versions' soundtracks (were the latter two soundtracks the same? I've never noticed...) by clicking the "ww/cf" button found in the lower-left corner of the site. It's a shame that I only like certain songs that play certain hours. I'd thus gotta' make sure I don't do work at certain hours? Meanwhile, I dunno', I think full-time cubicle work would be okay in that, I dunno'.. As a full-time student / part time retail clerk, I really want the opportunity to *not* work with the public and be able to wear a shirt and tie. Y'know? Ah, you've got a point, SUIKA. I find all of the AC music to be pretty calming, so all of it is OK with me, but I can see it being an issue if you only like certain tracks. As for working in a cubicle: I was kind of kidding :) That's what most folks consider to be the ultimate in mundane/boring jobs, don't you think? Or is retail considered worse? And @SUIKA, I heat you on that one! Ugh. The opportunity to NOT work with the public would be awesome and would make me like the public a whole lot more.